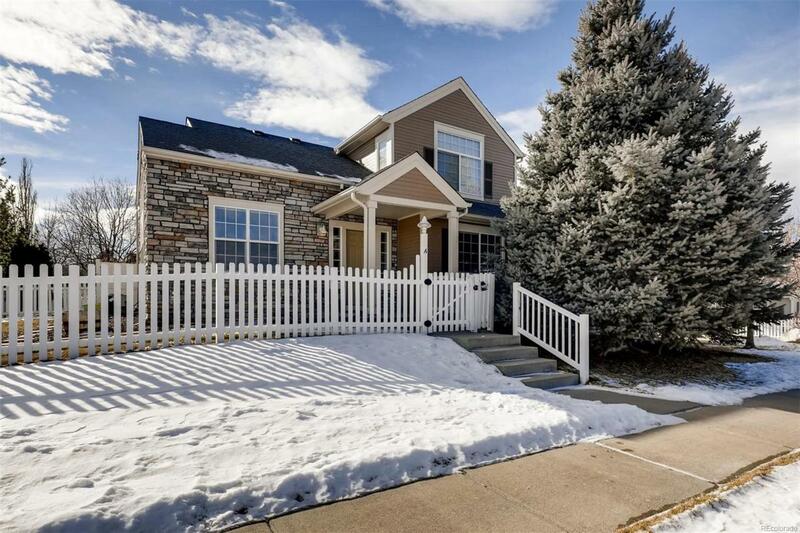 Amazing Upscale College Hills CORNER UNIT w/ everything including white picket fence! All brand NEW hard wood flrs, carpet, granite, faucets, undermount sinks & interior paint make this feel like a new build. From the moment you walk in the front door you are astonished by vaulted ceilings, natural light, & open flrplan. TWO master bdrms are an incredible feature. 1 master & 2nd bdrm located on main level for easy access & 2nd master is upstairs- complete privacy & breathtaking MOUNTAIN VIEWS. Kitchen has new GRANITE countertops, island & ample storage. Off the kitchen is living rm w/ gas fireplace & a dining/sitting rm as well. Washer/Dryer Included! Find peace & quiet in your bckyard or check out your community amenities including walking trails, pool, & tennis courts! Steps away from Stratford Lakes community pond, golf course, shopping, restaurants & coffee shops. 2 car attached garage & LRG unfinished bsment w/ tons of storage or build out to your liking. Truly is an amazing find!